Following our recent developments in the field of Perovskite Solar Cells, and the kick-off of CTI-sponsored project with LPI laboratory at EPFL, we are announcing today the launch of a new set of products for this revolutionary solar technology. The all new Ti-Nanoxide BL/SC, Ti-Nanoxide T300/SC, and Ti-Nanoxide T600/SC are respectively designed for the formation of compact titania layers, 300 nm thick mesoporous titania layers, and 600 nm thick mesoporous titania layers by spin-coating technique. 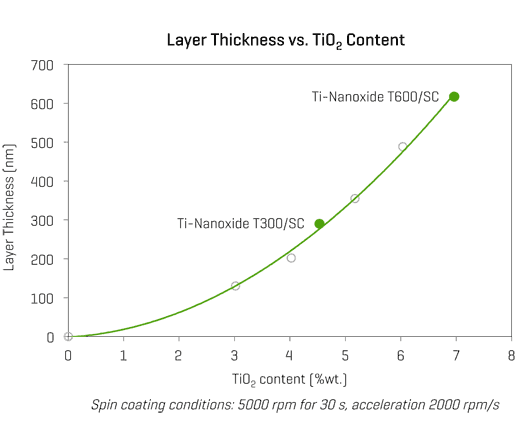 Ti-Nanoxide BL/SC offers a simple and convenient way to create a 50-70 nm compact titania layer by spin-coating the solution (5000 r/min for 30 s, acceleration 2000 r/min) and firing the coated substrates at 550°C for one hour. The resulting compact layers, also referred as “blocking layer”, is a pre-requisite in not only Perovskite Solar Cells but also most solid-state Dye Solar Cells where it acts as an electron-selective barrier on the anode. Ti-Nanoxide T300/SC and Ti-Nanoxide T600/SC on the other hand, will lead to the formation of respectively 300 or 600 nm thick mesoporous titania layers by spin-coating the product (5000 r/min for 30 s, acceleration 2000 r/min) and firing the wet substrates at 475°C for 30 min. The mesoscopic structure obtained by the sintering of nano-particles in the process makes a perfect host for perovskite crystals. What’s more, advanced users can advantageously tune the thickness of their mesoporous films by adjusting the concentration of Ti-Nanoxide T300/SC or Ti-Nanoxide T600/SC with the help of ethanol and the calibration curve shown below. Customers preparing electrodes by screen-printing or slot-coating will be glad to know our catalogue already features equivalent products for these deposition techniques as well, namely Ti-Nanoxide BL/SP, Ti-Nanoxide T300/SP and Ti-Nanoxide T600/SP.